When two Metrobloggers hang out, stuff happens. For example, Rachael and Susie and I went walking around my neighbourhood last Friday, and we stumbled upon this quirky scene (see picture). 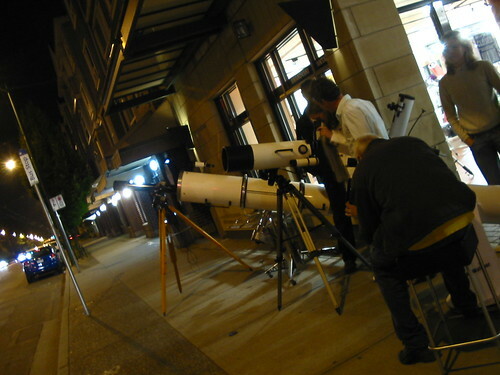 The folks who run Vancouver Telescope Centre (3303 W. 4th Ave.) apparently set up telescopes outside their shop every weekend night so long as the weather is clear. People can come by and take a peek. I saw the stripes (and perhaps the Great Red Spot) of Jupiter. Also participating were several drunk guys and girls from nearby Nevermind (motto: “Good times in your mouth”) who were able, without much prompting, to spot the full moon. That’s really cool. We’ll have to check it out soon! Thanks for the tip, Travis.